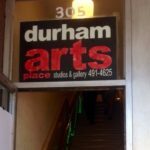 Durham Arts Place, founded in 1996, provides affordable artist studio spaces to over 20 artists. In addition to the studios, the building houses Through This Lens gallery and frame shop – a gallery of fine art photography and also the Durham Arts Place Gallery, a gallery space curated by artists exhibiting the works of Durham area artists and others. The gallery is open most Third Fridays and by appointment by calling 919-491-4625. Durham Arts Place is located inside the Loop in Downtown Durham, 305 E. Chapel Hill Street.